Coconuts Beach Club Resort and Spa, Samoa. 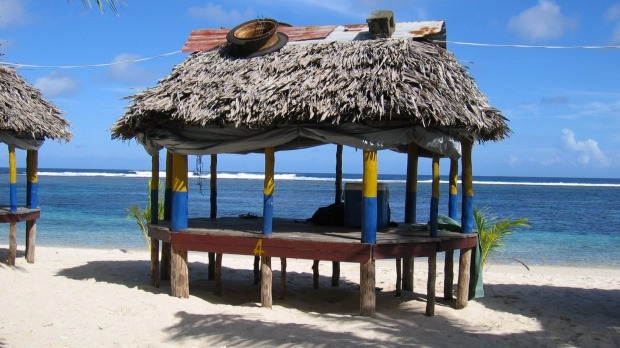 FIVE-STAR FOR LESS IN FIJI Forego Fiji's island resorts and save big bucks by staying on the main island of Viti Levu. One of the best value five-star resorts is the Outrigger Fiji which offers snorkelling along the reef fringed coastline, an award-winning spa, friendly staff and legendary nanny service from $244 per night. For stays of six nights or more kids eat free, nanny service is included along with complimentary kids club. See outrigger.com. BAG A BARGAIN IN A BALI Bali offers an affordable getaway, especially once you're actually there, however upmarket resorts in fashionable Seminyak, Jimbaran and Nusa Dua can be pricey. The new Mantra Sakala​ Resort and Beach Club Bali is an affordable and fabulous five-star find offering stylish beachfront digs at Tanjung Benoa​ near Nusa Dua proper, free kids club, free Wi-Fi, affordable spa treatments and more from $128 per night. Or book seven nights for a family of four for $1668 with a truckload of inclusions. See mantrasakala.com. SELF-CONTAIN YOURSELF By doing without luxuries like in-room dining, daily servicing (except at CBD properties) and porterage, Oaks Hotels and Resorts can deliver savings on holidays in prime locations across Australia and overseas. Plus their spacious self-contained apartments can accommodate the whole gang. 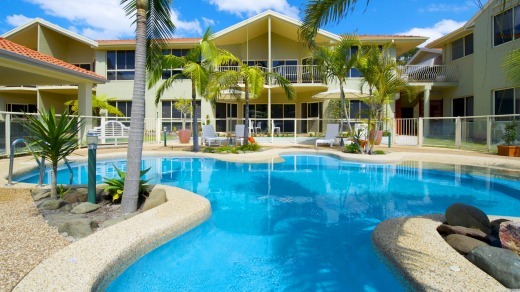 The Oaks Gateway on Palmer, which sits along Townsville's bustling restaurant strip, is one of their best, with luxury apartments and an outdoor pool offering magical views across the Ross River to the Coral Sea and Magnetic Island from $127 per night. See oakshotelsresorts.com. Outrigger on the Lagoon, Fiji. KOH SAMUI? YOU MUST BE KIDDING This stylish newcomer on the serene sands of Lamai Beach oozes old world charm with yellow and white hues framing vistas of white sand and turquoise waters. The 148-rooms featuring Jim Thompson silk furnishings start from $208 per night with a huge bonus for families being children 16 years and under stay, play and eat for free. Guests also save on stays of five days or more including daily breakfast, Wi-Fi and scheduled shuttle transfer to Chaweng. See manathai.com/samui. FALE-SAFE IN SAMOA With overwater fales rivalling Tahiti and the Maldives, this tranquil four-star resort offers a postcard perfect white sand beach, gorgeous spa and views to die for. It's also excellent value, with meal deals that include alcohol, complimentary mini bar and savings for return guests (of which there are many). Beach fales start from $US389 or book six nights from $1609 per person through Helloworld and Viva! Holidays. See helloworld.com.au; cbcsamoa.com. MISSION POSSIBLE The beachside town of Mission Beach, 90 minutes south of Cairns, feels like Port Douglas 20 years ago, with an uncommercial, laid back feel. Castaway's contemporary motel style rooms and apartments look across the calm Coral Sea to Dunk Island through coconut palms. The beachfront resort features two pools and offers terrific value, priced from $190 a night, however package deals are the way to go with inclusions such as breakfast and spa credits thrown in. See castaways.com.au. CEYLON THE MONEY Located on the Kalpitiya peninsula in a quaint seaside village, this tropical resort exudes boho chic with cabanas and villas set in lush surrounds. An open-air pavilion looks out onto a 40 metres pool surrounded by sun beds to the sea beyond. The all-inclusive rates make it a steal with full board from $US210 a night twin share in a simple yet stylish cabana. See barreefresort.com. BIG SAVINGS AT LITTLE BEACH Port Stephens, come the weekend when half of Sydney decides to get out of town, can be expensive. If you can get away midweek, boutique resort Marty's at Little Beach offers savings on stays in its tasteful, self-contained apartments and motel-style rooms located between two of Port's most gorgeous beaches. Plus you'll avoid the crowds. From $285 for three nights in a queen studio room including cheese board, bottle of wine and discount vouchers for watersports and massage. See martys.net.au. NOT PRICEY ATOLL The Maldives' dreamy turquoise waters and heavenly overwater villas equals one big-ticket holiday; however the Holiday Inn is the exception to the rule. This funky 160-villa resort with its white washed interiors in the South Male atoll features great food, an excellent spa and is heaven on a stick for divers and surfers from $US297 ($414) per night. Buy an all-inclusive package including meals and alcohol for even better value. 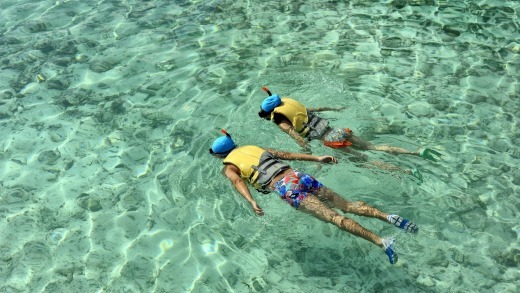 See maldives.holidayinnresorts.com. VALUED-ADDED LUXURY Let's get this straight: the five-star Jean-Michel Cousteau eco-resort at Savusavu is not cheap, but when it comes to value, it's hard to beat. Located on Fiji's second largest island Vanua Levu, it's one of the world's best family resorts. 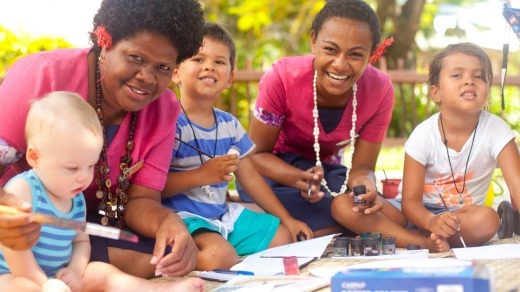 Every child under five gets their own nanny from 8am to 9pm (later or earlier if needed), kids five and over are assigned a buddy and all children have free access to the Bula Club, considered the Pacific's best kids' club. All meals are included and most activities, so you can go for a snorkel, dive world-renowned reefs, and kick back by the pool knowing your children are in the best of hands. A six night all-inclusive package for a family of four works out around $6,150. See fijiresort.com.